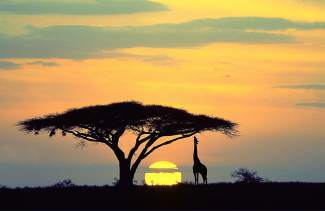 Giraffe at sunrise feeding on acacia, Serengeti National Park, Tanzania. What: High Country Speaker Series with nature photographer Boyd Norton. When: 5:30 p.m. on Tuesday, March 11. More information: Visit www.walkingmountains.org, or call 970-827-9725. AVON — The 12th annual High Country Speaker Series, a partnership between the Eagle Valley Library District and Walking Mountains Science Center, continues Tuesday, with a presentation by well-known nature photographer Boyd Norton. Norton has spent his career sharing the wonders of unique wild places through his photography and writing, while at the same working for their long term preservation and protection. Norton has been a conservation photographer for over 45 years and has been called “one of the 40 most influential nature photographers from around the globe” by Outdoor Photography Magazine. He has published over 16 books. Throughout his photography and writing career, he has played an important role in greater protection for iconic wild places, including testifying before numerous U.S. Senate and House hearings on behalf of wilderness and park preservation legislation. Through his activism Boyd played a key role in the establishment of the Jedediah Smith Wilderness Area adjacent to Grand Teton National Park, the Sawtooth National Recreation Area and Wilderness, Hells Canyon National Recreation Area and Wilderness, the Frank Church/River of No Return Wilderness Area, and the newest national parks in Alaska. Along with David Brower, in 1990 he met with Russian Foreign Minister Edward Shevardnadze, to gain support for the designation of Siberia’s Lake Baikal as a World Heritage Site. Norton was a pioneer in providing nature photography workshops in the 1970s, initially in the western United States, expanding to exotic places such as the African Serengeti. He has become an expert on the Serengeti ecosystem, spending more than 1,000 days in the field over the span of 30 years. He is the founder and co-director of Serengeti Watch, a nonprofit for preserving the Serengeti ecosystem. Through his photographs and writing, Norton’s book on the Serengeti, “The Eternal Beginning,” tells the story of this diverse and important ecosystem and the changes that have taken place since he first started visiting. At the High Country Speaker Series on Tuesday night, Norton will share his photography and discuss sustainability issues of Africa’s Serengeti. This program is free to attend and open to all ages.